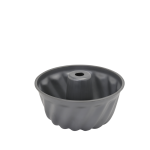 Our plastic baking moulds made of LCP or SPS have similar non-stick properties as metal baking moulds. The advantage is that this property is preserved when the surface is damaged. This means, that the moulds do not get rusty or lose any coating. The moulds resist temperatures up to 446°F (loaf pan up to 500°F) and can easily be cleaned in the dish washer or other cleaning devices. 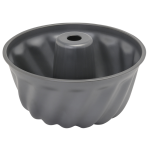 They are handy and lighter than metal moulds and create less noise in the bakery. Practical experience shows that the temperatures resp. 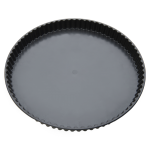 the baking time can be decreased by around 10% compared to metal baking moulds. Another possibility to decrease the baking time is to use this mould in the microwave. The innovative material is already used in other cooking and baking applications. After use, it can be recycled completely resp. burned without leaving any residues.